The "lost" issue of MARVEL TWO-IN-ONE: When Ben Grim met the Space Knight. This, the penultimate issue of the run, was published in early 1983 (the May cover-date being, of course, several months ahead of the on-sale date) and is, today a mainstay of the 50p boxes. If you see a copy: grab it. It's clearly not demanding high dealer prices (ahem), or generating lots of reader demand, but it is the only issue of T-I-O that hasn't (and won't be, for the foreseeable future, anyway) reprinted. The final ESSENTIAL TWO-IN-ONE volume simply skips the issue. 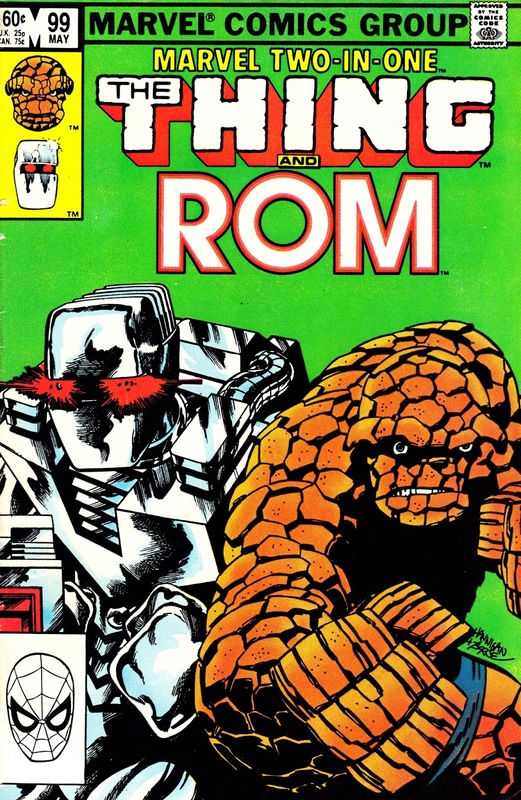 That's because Rom is trapped in a limbo that means that Marvel had long since lost the rights to the character despite firmly implanting him inside the Marvel Universe for the duration of the license (75 issues and 3 annuals). That sales-boosting integration has also been preventing anyone else from acquiring the reprint rights: they'd also have to negotiate with Marvel to use all the MCU characters that pop up throughout the run. This was reprinted in issues 15-16 of THE THING IS BIG BEN, making it Rom's last in-continuity UK appearance. His SECRET WARS II crossover episode was omitted from the British run, possibly because Marvel had already handed back the license.